We love our kids, but going out with them can be a nightmare. Add an international flight, language barrier, and cultural differences to the mix and you just might wonder what you did in a past lifetime to earn such a punishment! 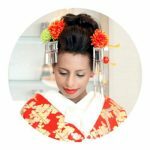 While I can’t guarantee that your Japan trip will be free of tears and meltdowns, I can share my domestic and international travel experience to help make your trip as smooth as possible. 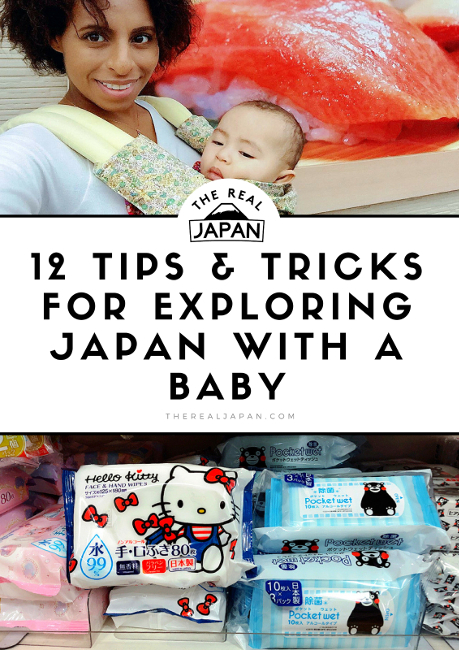 I’ve put together a list of 12 tips and tricks for exploring Japan with a baby or toddler just for you. 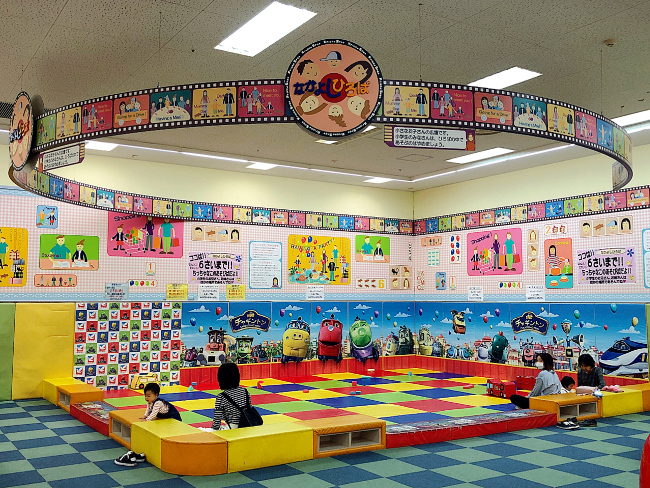 Ready to see The Real Japan with your little ones? 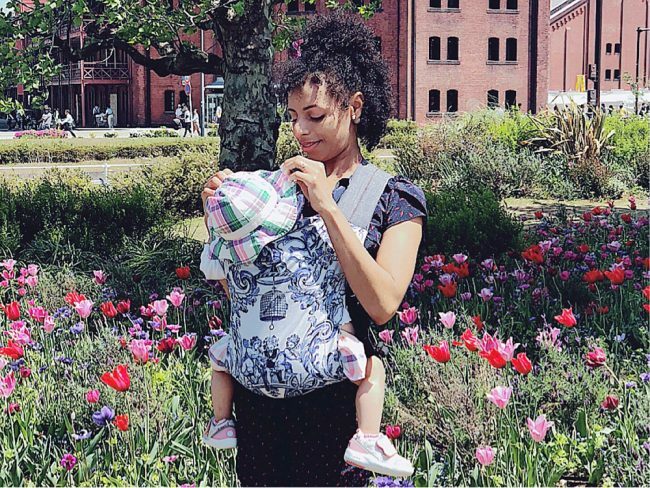 Wondering what to pack for your trip to Japan with a baby or toddler? Take everything that’s currently in your diaper/nappy bag, and multiply it by 2! When traveling with littles ones, it’s always best to expect the unexpected. Packing for your Japan trip begins with your international flight. It’s a good idea to have an airplane carry-on list of flight essentials. You can download a copy of my Flying To Japan With A Baby: Carry-on Checklist here. In the summertime, air conditioned buildings, buses, and trains can feel extremely chilly. Likewise, heated buildings, buses, and trains can feel stuffy. Dress your child in layers so that you can adjust for temperatures. An alternative is to bring a lightweight blanket. 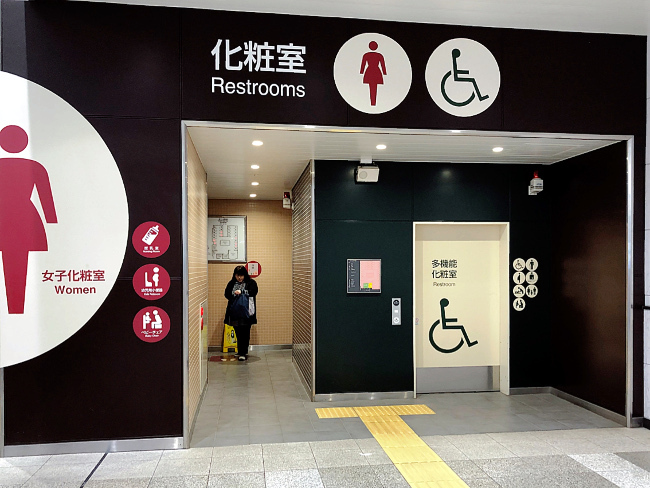 Overall, public restrooms in parks and train stations are very clean. However, you might quickly notice that there’s no soap dispenser or hand dryer. Be sure to bring a handkerchief, plenty of antibacterial wipes, and hand sanitizer! Generally speaking, you won’t have to worry much about where to go when you need to change your child’s diaper. Public toilets will have at least one changing bed. 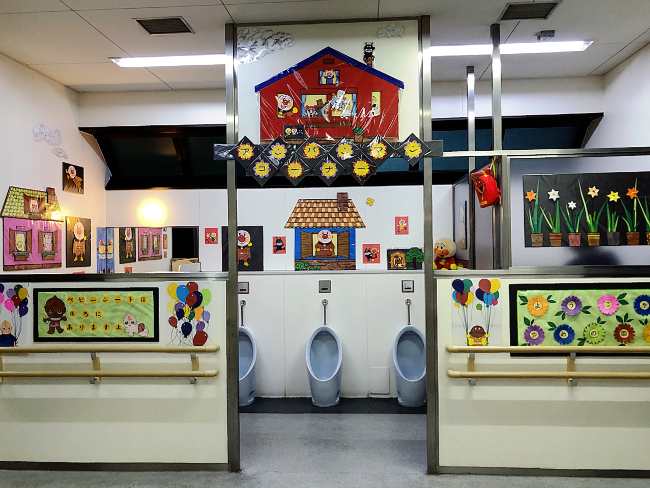 Bathroom stalls often have special seats for babies and toddlers, and it’s not uncommon to find a diaper changing bed in the men’s restroom. You can also find multi-purpose toilets or even “family” toilets. Nursing rooms are commonly found on the baby/kids’ floors of shopping malls and department stores. While men can enter the changing rooms, they should not enter the nursing room, even if it is a private booth. 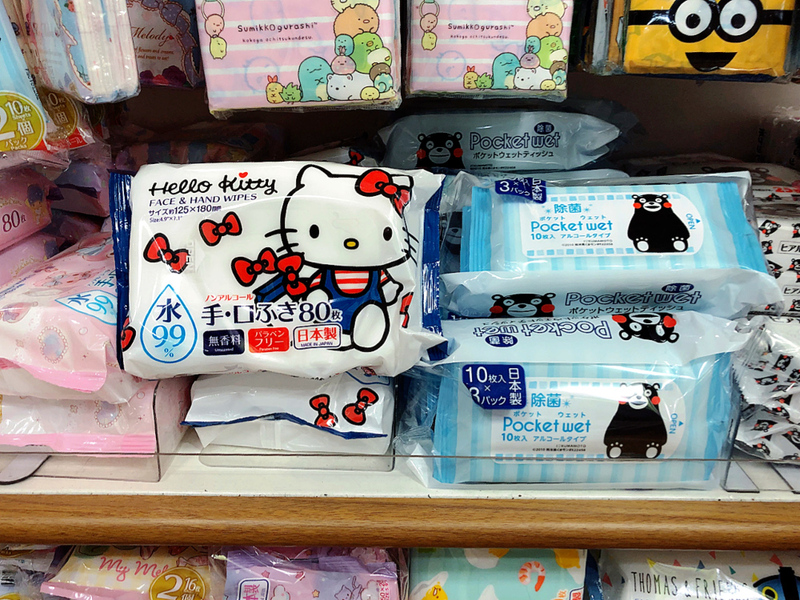 Despite being nearly everywhere you turn, Japanese convenience stores aren’t so convenient when it comes to stocking the basics for babies and toddlers. This is especially true if you need to buy diapers or wipes! Err on the side of caution and bring plenty with you on the go. Instead, head to a department stores or shopping mall, which will have a floor dedicated to babies and kids. Look for キッズ　(kizzu/kids) or 赤ちゃん (akachan/baby) on the floor guide. 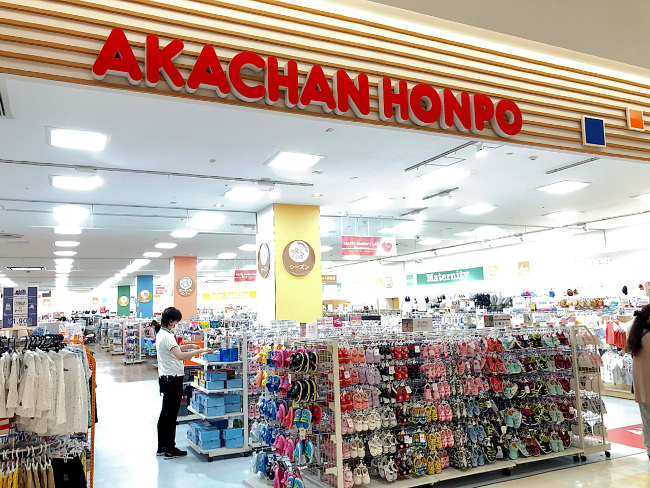 If you come across a 100 yen shop (Daiso, Seria, and Can-Do) you’re in luck because they stock nearly everything you will need for babies and toddlers. Japan, especially its sprawling cities, is known for its punctual and efficient transportation network. It’s also known for packed trains operating above capacity. Of course, you want to avoid travel during peak hours (weekday mornings and evenings) but sometimes our itinerary throws us a curveball. During morning peak hours, make use of the “women only cars,” (女性専用車/josei senyou sha), the first car located at the front of the platform. Throughout the day, try to sit in “priority seats,” (優先席/yuusenseki) which are often located next to elevators and escalators. Yes, it may be cumbersome to take both when traveling, but train stations, especially in the city can be terribly congested and the platforms very narrow. On top of that, elevators are few and in high demand (though this is changing). Take along a carrier so that you can easily get through crowds, climb stairs, or use the escalators. Use the stroller to transport all your gear. 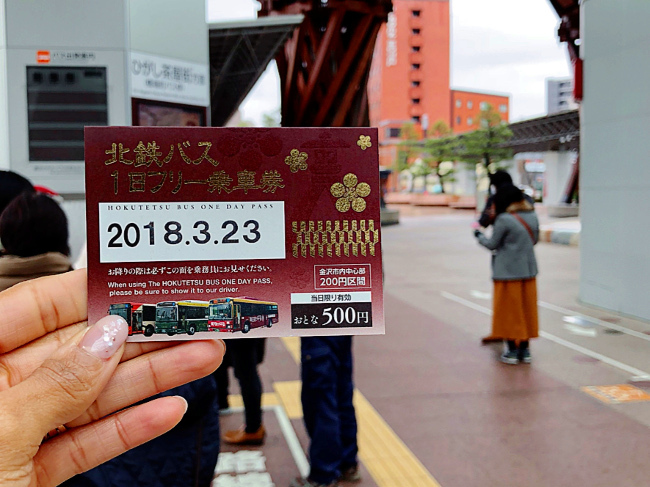 You can purchase these cards at train stations throughout Japan, and they can be used to pay your train or bus fare. Charge before your day adventure and you won’t have to worry about how much the fare is to your destination. These cards are a great way to avoid long lines at train stations and popular tourist spots. Another reason to get a rechargeable ‘IC card’ (as they are known) is because they can be used at convenience stores, vending machines, etc. across Japan. They are a hassle-free way to make purchases without fumbling around for change, perfect for when you’re traveling with kids. Combine your rechargeable IC card with a one day pass. 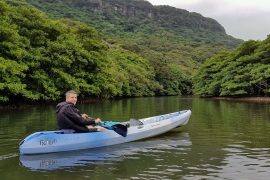 These are great way to explore the area near your accommodation or your destination. Alternatively, if your kids are having a meltdown, it may help to get off the bus or train and help them calm down. Don’t let the buses intimidate you. They are often a welcome alternative to crowded train stations and are a great way to see Japan with a baby up close. The only downside is that buses may not be a comfortable option waiting outside when it is too hot or too cold. The pair seating is also a great choice for tired kids to lay out on your lap without disturbing other passengers. Japanese restaurants often have kids’ menus or free drinks/meals for children under 3. While it’s also good to bring your child’s favorite snacks when traveling, there are plenty of tasty and healthy options for babies and toddlers. 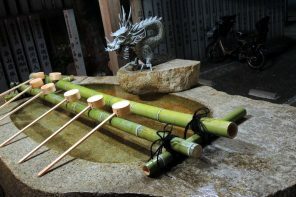 Nearly every Japanese person grew up drinking barley tea. It’s the drink of childhood and humid summers. Barley tea is non-caffeinated and has a roasted taste that feels more refreshing than still water. 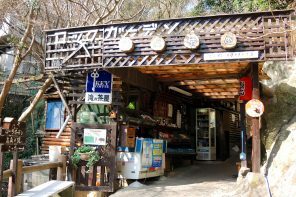 It’s sold everywhere — in convenience stores, supermarkets, and vending machines, normally around 100 yen a bottle. Look for 麦茶 or むぎ茶. One of the most family-friendly dining spots in Japan is a conveyor belt sushi spot. Choose a dish from the lane or order from the multilingual tablet provided at your table. Some spots have games, or other forms of entertainment. But, nearly all will have kid-approved choices like fruit juice, milk, chicken nuggets, fries, and jelly. While options for babies are limited, you will appreciate the escape-free baby booster seats that attach directly to the table. 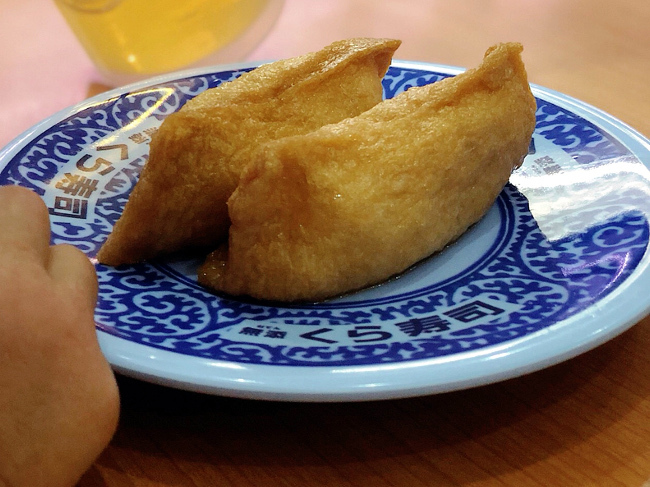 Best sushi picks for kids: inari zushi (“pouches” of fried and sweetened tofu filled with seasoned rice), natto (fermented soybeans) rolls, tuna rolls, or cucumber rolls. If you need a mess-free kids’ meal on the go, just pop into a supermarket or even better, a convenience store, for the classic rice ball, called onigiri in Japanese. Kids will love wakame (わかめ, a type of seaweed), konbu (昆布/kelp), or natto (納豆, fermented soybeans) rolls. While Starbucks may not scream “Japan” to you, the cosy, smoke-free environment is a wonderful place to rest. They often occupy prime real estate and are a great place for people watching and taking a break. The dim lighting can also help calm down excited kids. Use the free wi-fi to entertain kids, catch up with relatives back home, or check out the next stop on your Japan itinerary. 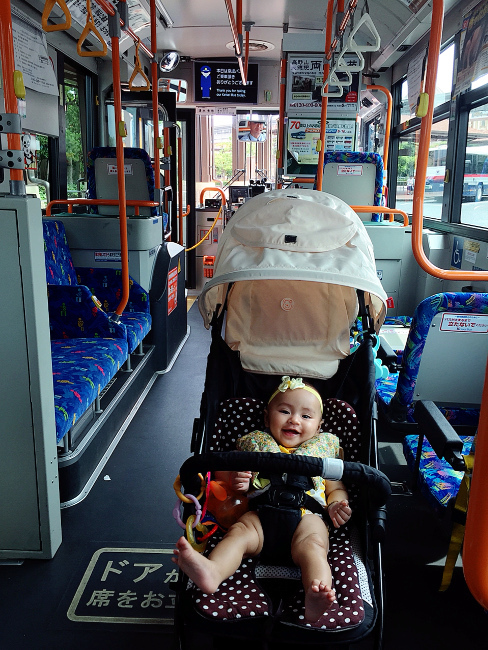 There you have it, 12 tips and tricks for exploring Japan with a baby or toddler. While it’s not an exhaustive list, I hope these are useful tips that will relieve some of the stress as you plan your Japan trip. 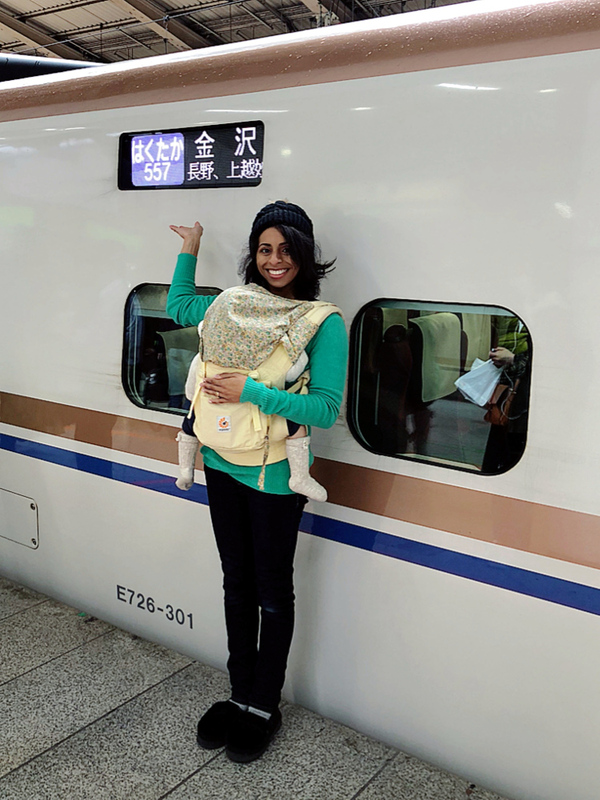 Do you have any questions or experience of travelling to Japan with a baby or toddler? If so, please leave a comment below. 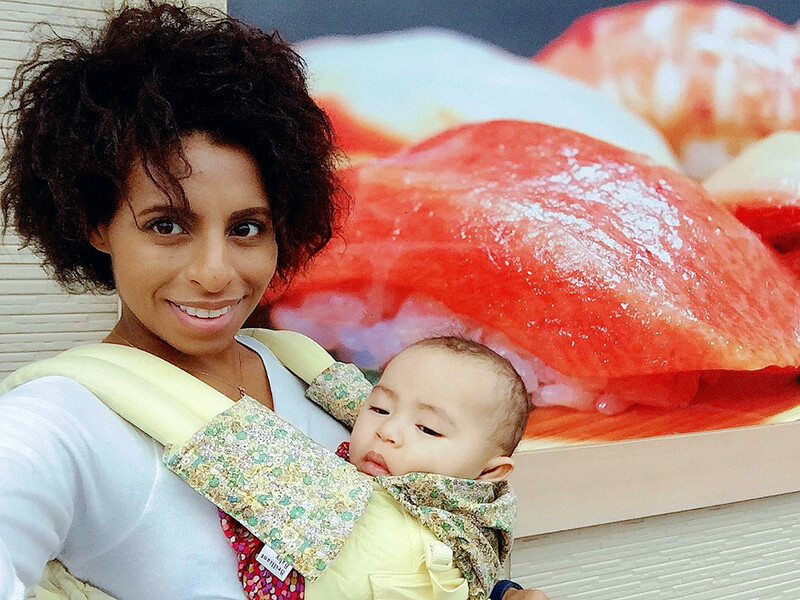 Author Teni Wada is a blogger, content creator, and first-time mom documenting her journey of motherhood in Tokyo and travels with baby at BabyKaiju.com. 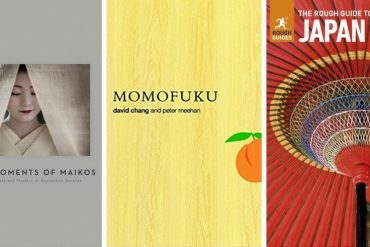 Download your copy of the Flying To Japan With A Baby: Carry-on Checklist. Feedback and questions welcome – please leave a comment below.